Global Game Jam ’17: Squiddy Squiddy Go Go! Just like last year, I joined the Global Game Jam (a 48 hour jam to make a game), which took again place in The Big Building in Groningen.This time however, as a ‘real’ colleague, since I became a teacher/coach at the game development & design department at Hanzehogeschool! So we joined as a team of teachers (with Ilja, Ivo & Ben) with a variation of skills and I was eager to work on (the art of) a fun game again. The theme was ‘waves’ this year, and after the kick-off we quickly began to brainstorm, first on our own and then together. Combining ideas, scrapping others…it was a bit hard to choose even because we had multiple interesting concepts, for example something with walking on an island to escape from a tsunami, extreme rope/jump-skipping (with crazy levels), working with echo-location and then the one which we chose: something with creating waves. 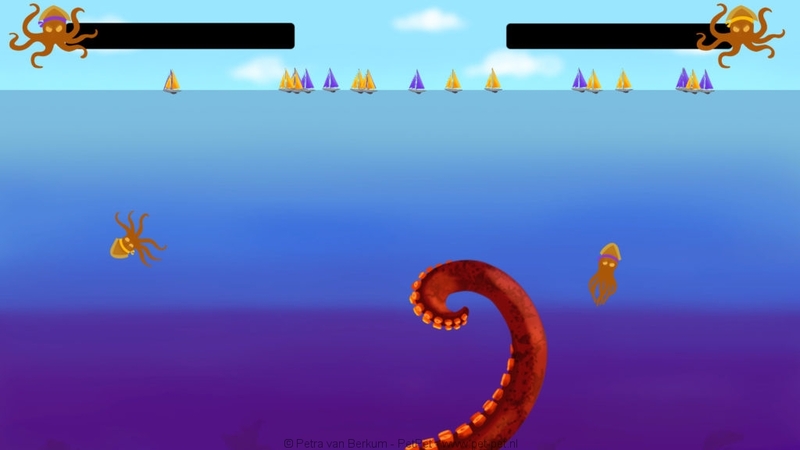 Somehow I had ideas with animals in mind, so we ended up working with squids (because we needed big animals which can make waves…and just because it was funny)…which were big krakens at the start but they looked a lot tinier on the screen proportionally, which is why they became ‘squiddies’. The squids had to take down boats. 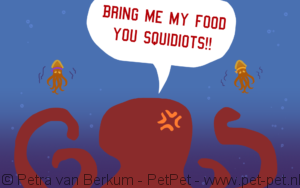 I started out with a quick design for the squid and after that started on the animations for swimming and ‘waving’. I was quit tired that evening so left early for home (yes yes, lame-jammer, but a good night sleep is worth a lot). On saturday we still weren’t exactly sure about what the game would be like, we first had in mind that the squiddies were competing to get the most boats down, and could fight eachother..but at some point it became just too simple and boring and we wanted to have more of a (funny) story behind it and make the game more fun and dynamic with lots of ‘dangerous’ things for the squids so it would be a lot harder to take the boats down. 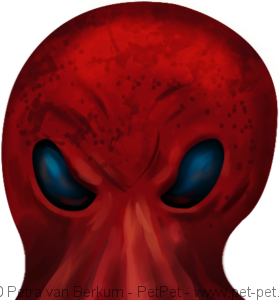 We then came up with that there was a boss-kraken who would swipe his tentacle around and from then on the story was that the two squiddies worked for this boss, who was a hungry kraken waiting for his food (the boats) and otherwise would eat one of the squids. Next, we also thought of a shark and a war-ship with mines to make it a bit more of a challenge, I drew them but alas there was no time to implement it anymore. During a 2-day jam you really get to know what is doable and what not. But that obviously also depends per person and what their priorities are. For example, if I would have know that the bubbles in the water wouldn’t have been implemented, I could have made a more interesting background. 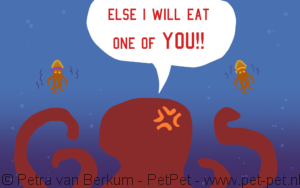 But in the end I did have fun drawing the intro/story-shots and the boss kraken a lot as well :). No prices this year for us, but I’m glad we made a playable game and glad to see multiple people have fun with it during the end-presentation. I was super-tired the days after, but glad I joined again! 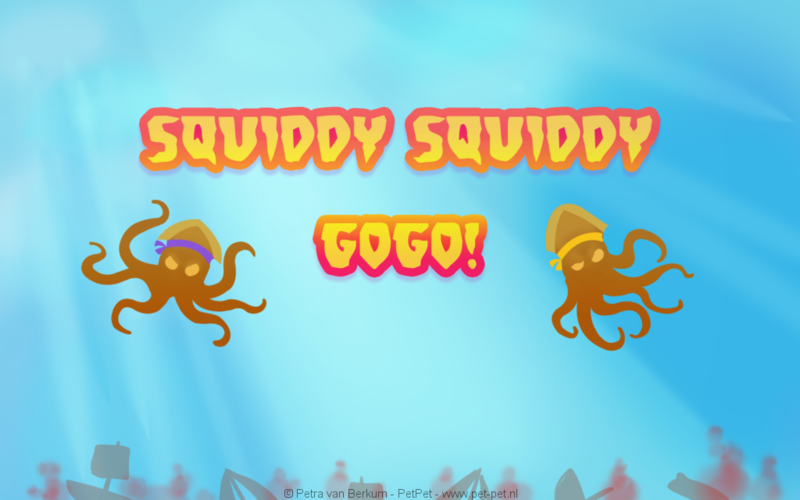 You can play Squiddy Squiddy Go Go, download it here!